As a “public golfer” I occasionally get to play at private clubs where friends of mine have memberships, but most of the time, private country clubs and courses are off limits to me and my golfguy. It’s not that I don’t love public courses. There are a ton of them that are great – just look at Chambers Bay – it’s not only public – it’s a muni! And let’s not forget Torrey Pines. But there are so many private golf clubs out there that I would love to play, but just can’t find a way into them….until now. I just discovered Boxgroove.com. 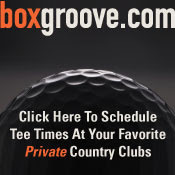 For a nominal annual fee of only $49, Boxgroove.com offers anyone the opportunity to play at private clubs in the USA (they are working on some in Canada as well). I only heard about Boxgroove recently, but I’m already planning some golf trips in the spring where I will use it to see how “the other half” plays. So…Tampa in January, Arizona in February (can’t wait to try out Greg Nash’s Bella Golf Club and Pete Dye’s Red Mountain Ranch Country Club) and Palm Springs in April. Sounds like a plan for the spring. Now what about summer…Hmmm…Looks like there will be some great WA courses to play and if I get lucky, maybe a few in Vancouver BC. Maybe I’ll spend my summer vacation at home next year. That would be a treat. So…Get to work boys! I need Vancouver’s Marine Drive, Point Grey, Shaughnessy and Capilano on your site by June! I hope the concept catches on but it has serious hurdles to leap over, i.e., the IRS. Ryan, at Waggle Room Golf, took a look at BoxGroove also and received a ton of comments on the topic. As someone who belongs to a country club and has a degree in accounting, I can tell you that per I.R.S. guidelines, not-for-profit social organizations [e.g. 501(c)(7) clubs] are able to generate up to 15% of their total revenue from non-member use of club facilities. When used properly, Boxgroove.com is simply a tool clubs can use to maximize revenue within that threshold.